The 11-story high rise on New Hampshire Avenue was bought by a new owner in March. WASHINGTON — Tenants of the Hampshire Tower Apartments in Takoma Park are being hit with sudden rent increases of as much as 70 percent, forcing many to move. They’re pleading for help, and getting support from state and local leaders. 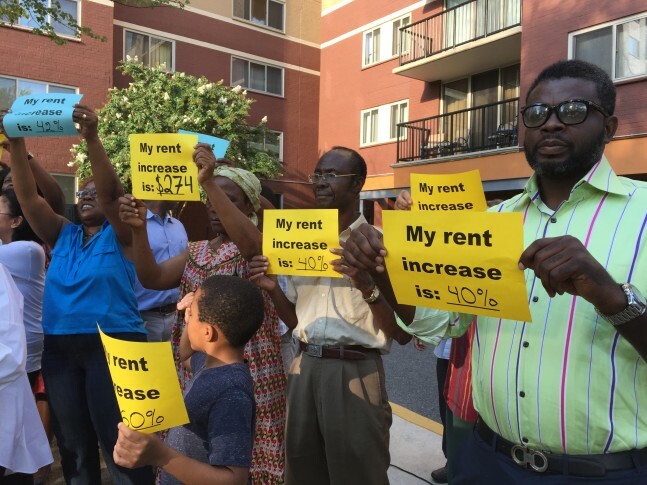 “On July 23, 2015, most of the tenants in this building were given rent increase notices that ranged from $200 to $639 that we currently are aware of,” said Margaret Buraimoh, acting President of the of the Hampshire Towers Tenant Association, at a news conference held Monday night outside the building. Nineteen-year-old Amy Carter has lived with her family at the high rise since she was 2 years old. Now she thinks they’ll have to leave because their rent is jumping up. Sadiatu Kabia, who’s lived in the high rise for 15 years, says her rent is increasing $200 a month to $1,474. The single mom, whose daughter is attending Montgomery College, says she has to stay put for now. Sen. Jamie Raskin, D-Montgomery, was one of several state and local leaders who spoke in support of the tenants. “We are asking the owners and the new management to be reasonable as we phase in the new rent increases,” he said. Councilmember Marc Elrich also spoke. “Hampshire Tower is a particularly egregious example of a landlord raising rents beyond what people can afford, risking their homes, risking their security and destabilizing our neighborhoods,” Matt Losack, with the Montgomery County Renters Alliance, tells WTOP. Prior to the purchase of Hampshire Tower Apartments by Orlo Takoma, LLC in March 2015, the building was deteriorating, with over 580 code violations and a third party property condition assessment identified $3.6 million dollars in needed repairs. The Tenant Association wanted the building fixed by a new owner, but the rents were too low to justify the significant investment required. Extensive negotiations took place among the building’s Tenant Association, who was advised by their attorney, the City, and the County, to reach an agreement whereby a long and expensive list of repairs would be completed by the new owner in exchange for the ability to raise rents, subject to a host of limitations. The agreement included limitations that used standard housing formulas to cap rents for the entire building so that they would be affordable for those who earn only 60% of the average income in the area. In addition, approximately 25% of the tenants in the building were given additional protections, limiting their increase to about 2% per year. Pursuant to Takoma Park Law, the Tenant Association had the right to ultimately approve or prevent the purchase of the building, and they chose to approve it. The Tenant Association choose to have the required repairs done to the building in exchange for allowing the owner to take rents to the specified caps. The new owner exceeded its obligations by spending close to a million dollars on repairs in only a 4-month period. Yet some tenants still expressed concerns about the rents going directly to the caps. Despite exceeding its repair obligations and being within its rights (as negotiated with all parties) to raise rents to the caps, the owner met with the County/City and agreed to stagger the rent increase. Concessions were offered to ensure that no increase exceeded 25%, and tenants who could not afford the increase after the concession ran out would be given the right to terminate their lease without penalty. Moreover, the County and the owner are still actively engaged in an effort to find ways to further assist tenants with the rent increase. We appreciate the positive feedback from many tenants who are thankful to have a well-maintained building and understand that the rents needed to increase to justify the sorely needed investment.